Pine View Estates in Howell, New Jersey is an active adult community that enjoys a fabulous location near water, nature and thriving cities. Atlantic City, New York and Philadelphia are a little over an hour's drive away. Closer to home, residents will have no trouble finding grocery stores, banks, restaurants and other daily services. Those who choose to call Pine View Estates home will enjoy the amenities offered within the community clubhouse, as well as the outdoor amenities such as the swimming pool and tennis courts. This intimate 55+ community of 177 homes makes getting to know your new neighbors and making lifelong friends easy. At Pine View Estates, amenities are centered around the charming clubhouse. The clubhouse provides plenty of gathering spaces and activities. Residents can join in a game of cards, stay connected on the computers, or attend a party in the multi-purpose room. The clubhouse also contains a fitness center for those who desire to exercise and stay in shape. Pine View Estates' thoughtful amenities continue outside. When the weather is warm, residents can take a dip or lounge beside the swimming pool. There are two tennis courts perfect for some friendly competition. The picnic pavilion is the perfect place to embrace the community s natural beauty while hanging out with family and friends. Regal Homes started construction of Pine View Estates in 2006 and was completed in 2014 with 177 single family homes. Residences are available in seven floor plans. Homes feature two or three bedrooms, two to three bathrooms, and an attached two-car garage. Each home is thoughtfully designed with active adults in mind with flowing layouts that range from 1,221 to 2,081 square feet of living space. Pine View Estates is an active adult community that welcomes homebuyers aged 55 and better. Residents of Pine View Estates enjoy an active lifestyle both indoors and out. Homeowners plan fun activities and groups based on common interests and hobbies. Residents can partake in card games, challenge a friend to a tennis match or attend holiday and themed parties in the multi-purpose room. Pine View Estates gives residents the chance to exercise their bodies, expand their minds, engage in hobbies and make new friends. Pine View Estates is located in Howell, New Jersey with easy access to the Garden State Parkway, Route 34, Route 9, and Interstate 195. Located within minutes of this outstanding community, homeowners will find excellent cultural and entertainment opportunities. Jackson Premium Outlets and Freehold Raceway Mall have everything for all your shopping needs and there are many restaurants along the Jersey Shore sure to please your cravings. The pristine beaches of Spring Lakes, Manasquan, and Long Beach Island are a short drive from Pine View Estates. Other exciting attractions include farms, parks and memorials. 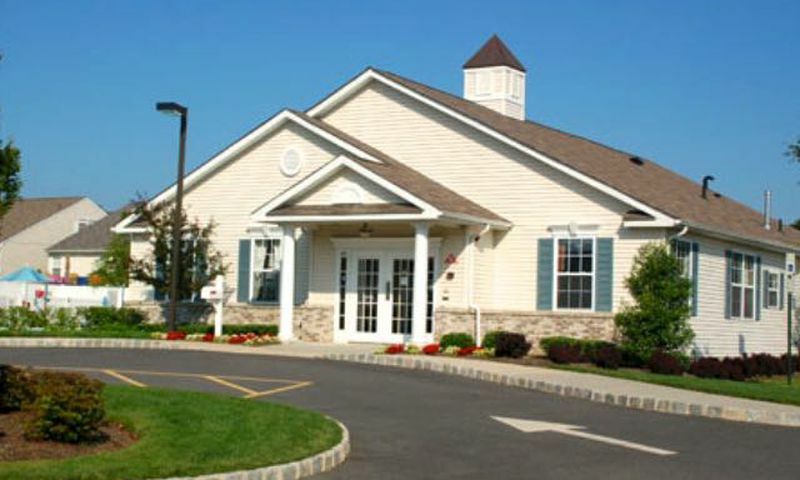 With an assortment of amenities and a laidback lifestyle, Pine View Estates caters to the needs of active adults in Monmouth County, New Jersey. Check back soon for more information on the lifestyle in Pine View Estates. Regal Homes started construction of Pine View Estates in 2006 and was completed in 2014 with 177 single-family homes. Residences are available in seven floor plans. Homes feature two to three bedrooms, two to three bathrooms, and an attached two-car garage. Each home is thoughtfully designed with active adults in mind with flowing layouts that range from 1,221 to 2,081 square feet of living space. We really like the location of this community. It's a short drive from the major cities and yet everything you really need every day is minutes from home. The beaches are close by, there is great golf, shopping, restaurants, you name it. The prices are reasonable, the people are friendly and the clubhouse is nice. We have been pleased with our purchase. 55places.com is not affiliated with the developer(s) or homeowners association of Pine View Estates. The information you submit is distributed to a 55places.com Partner Agent, who is a licensed real estate agent. The information regarding Pine View Estates has not been verified or approved by the developer or homeowners association. Please verify all information prior to purchasing. 55places.com is not responsible for any errors regarding the information displayed on this website.